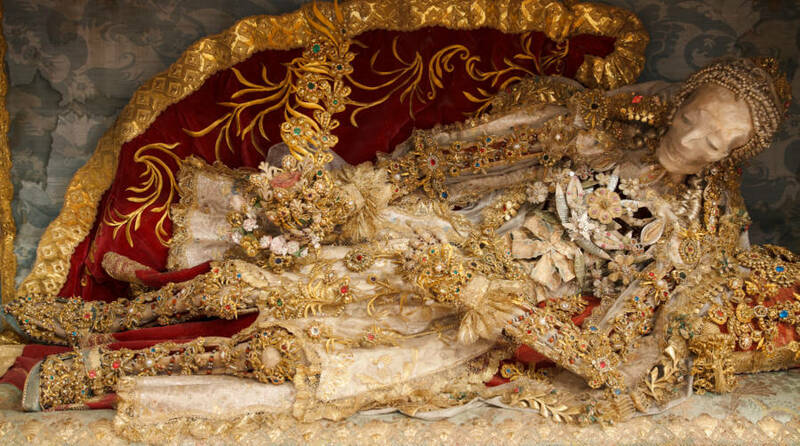 Catholic churches throughout Germany, Austria, and Switzerland are hiding dazzling secrets. 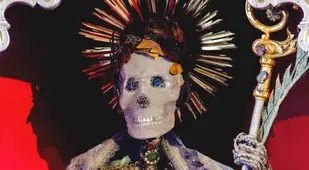 Now long-forgotten relics, elaborately bejeweled skeletons rest in back rooms and run-down rural chapels. 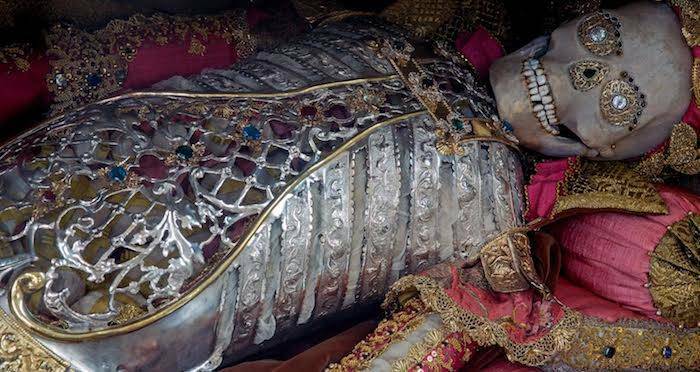 They’re holy relics from the 16th and 17th centuries, and the bones belong to martyrs that have been lovingly decorated by hand to reflect the splendor of heaven. 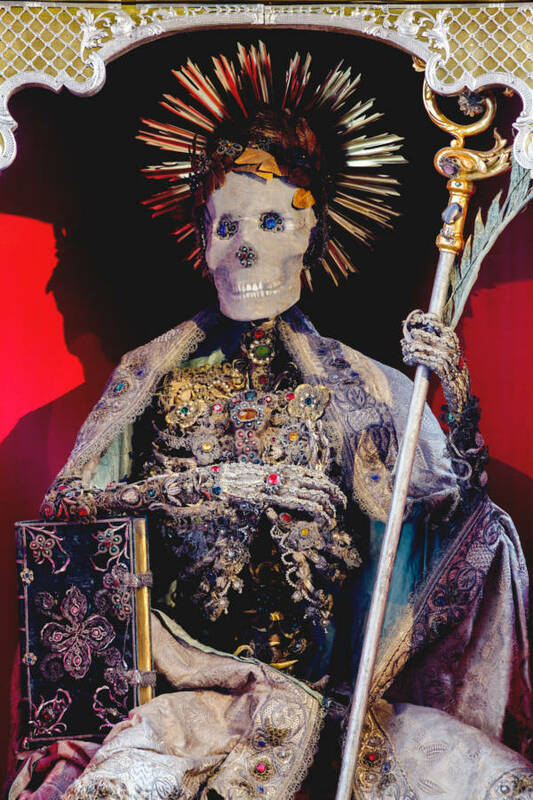 Art historian and photographer Paul Koudounaris captured over 70 of the bejeweled skeletons for his book Heavenly Bodies: Cult Treasures and Spectacular Saints from the Catacombs. In it, he brings to light an old tradition that at one point the Catholic church wanted to forget. In 1578, vineyard workers in Rome discovered a huge catacomb beneath the Via Salaria, one of Italy’s main roads. As they explored the catacomb, the workers were amazed to find that it contained between 500,000 and 750,000 bodies. The graves dated back to the fourth century and included the bodies of Christians as well as some pagans and Jews. In the early days of Christianity, Christians were widely persecuted; the Romans concluded that the bodies they had found were those of Christians who had died in the name of their faith. Northern Europe had experienced heavy anti-Catholic sentiment. Many churches were ransacked during the Protestant Reformation and had their holy relics stolen. 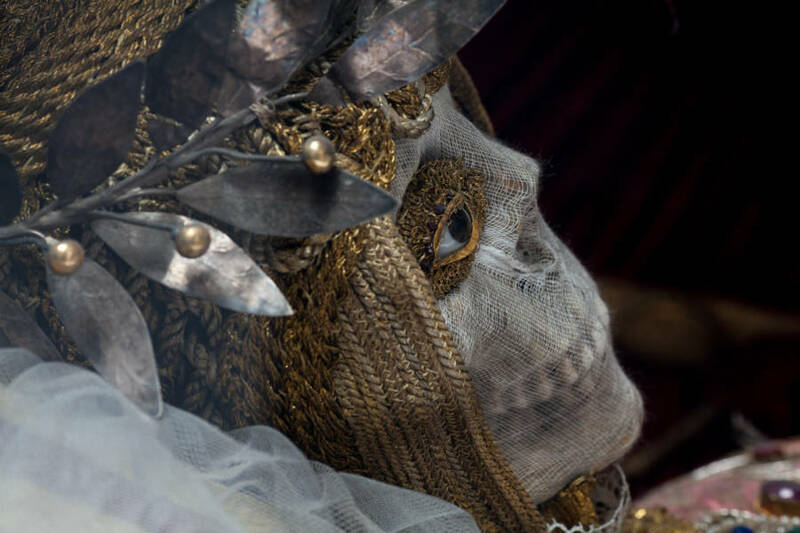 Now, some Catholics saw the newly discovered skeletons in the catacombs as a way to “restock the shelves,” so to speak, and give the churches new sacred items to display as a way to boost morale. 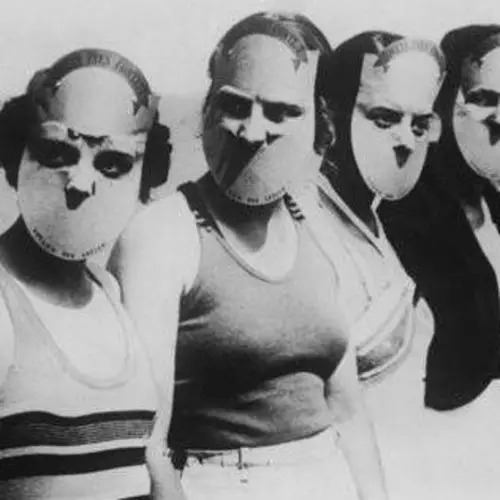 As sacred and treasured as the skeletons soon became, no one knew their true identities. 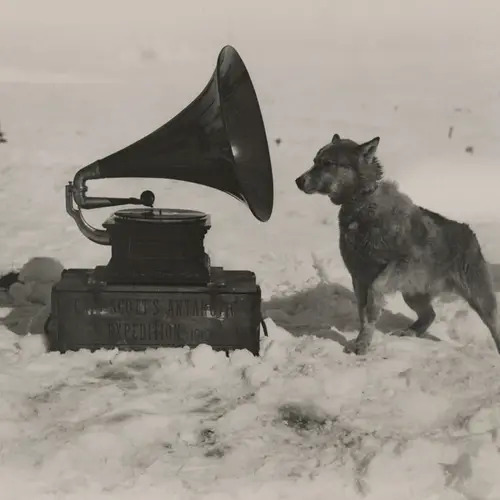 They were plucked from their graves and shipped to Germany, Austria, and Switzerland with very little information known about who they once were. Some skeletons were even taken because they had a letter “M” above their grave. While it assumed it stood for “martyr,” it could have easily stood for the very common name “Marcus.” According to The church even used psychics to locate bodies that they believed to be martyrs. Before the skeletons arrived at their destinations, they were given new holy identities. Each became a specific saint or deity for the church at which they arrived, with a name assigned by the Vatican. Churches were eager to order their new skeleton martyrs. While there was some doubt from within the Vatican itself, the churches had complete faith in the purchases they were making. Nuns and monks set to work cleaning and preparing their new relics, with nuns using their cloth-making skills to weave delicate sheets of mess to cover the bones. 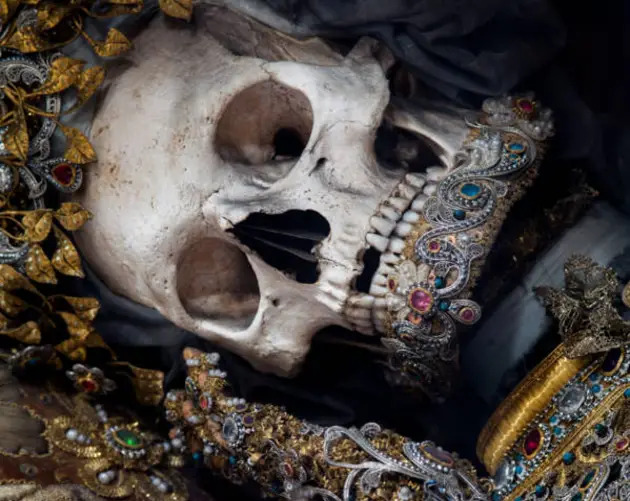 The jewels were skillfully and lovingly applied to the mesh-covered bones by the monks, and it often took years before the skeleton was deemed ready to display for the congregation. The gems and clothing were often donated by wealthy church patrons, but many nuns donated their own rings for the skeletons to wear. Once presented to the church community, the skeletons were a hit. 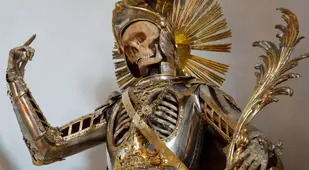 They were treasured by their patrons, and after a skeleton saint was introduced it was common for the first baby born within the church to be named in their honor (or about half the babies in the town within the first year). 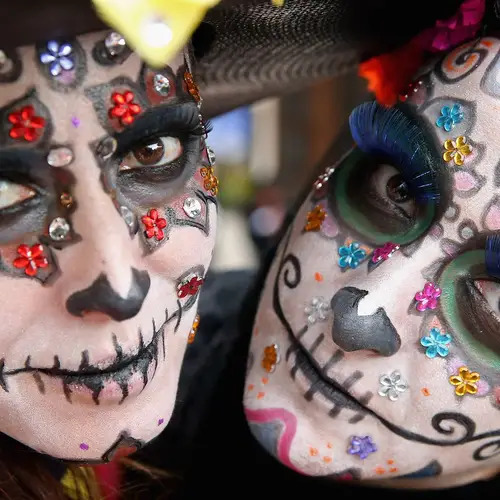 They became symbols of hope and faith for Catholics, as well as a tangible connection to the afterlife. The Enlightenment spelled the end for many of the holy skeletons after more than 100 years of enjoying the status of sacred relics. 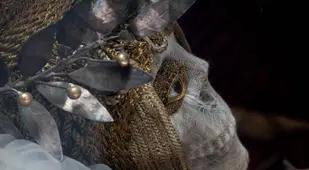 Ideas began to spread throughout Europe that changed the way the holy objects were viewed; the jeweled saints, and other relics like them, were seen as items of superstition. Holy Roman Emperor Joseph II declared in the late 18th century that all items whose origins were not fully known were to be discarded. Since this applied to the skeletons (whose identities in life could never be proven), many were stashed in back rooms, locked in closets, or even raided for their precious gems. The handiwork of the monks and nuns was destroyed. Many small towns were traumatized by the removal of their saints, who they had treasured for generations. However, not all of the skeletons were taken away from their posts, dismembered, or hidden. 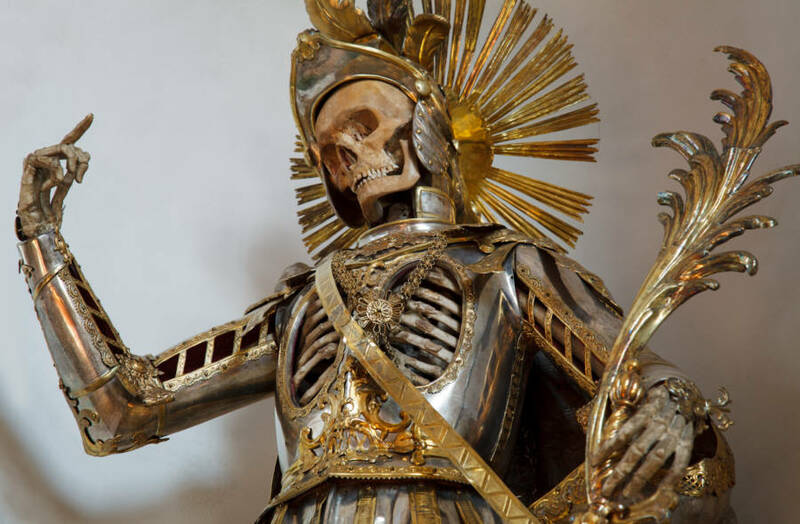 There are several churches throughout Europe whose skeletons survived the purge. 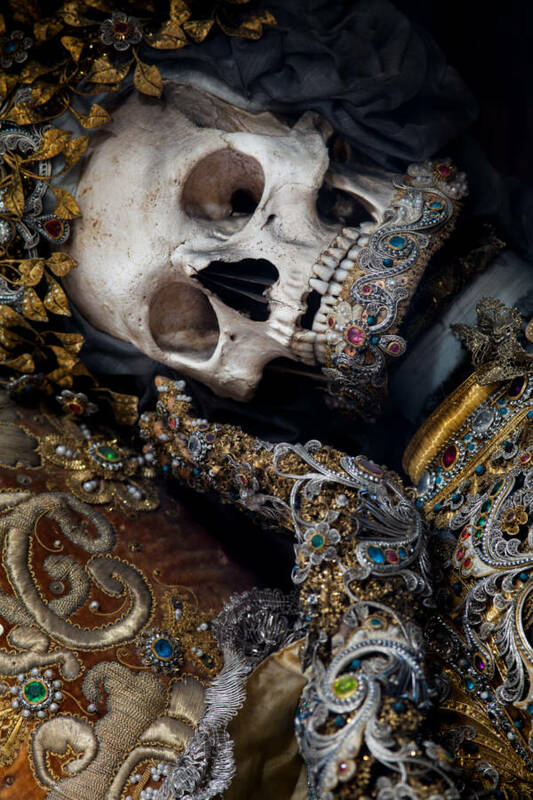 Today, the largest collection resides in Waldsassen Basilica in Bavaria, with 10 bejeweled skeletons in total. The glittering bones are displayed with pride, as valuable pieces of Catholic history and faith. Next, check out these photos the Paris catacombs, the world's biggest crypt. Then, read how the bodies of dead climbers serve as macabre guideposts on Mount Everest.